A LIVE, WRIGGLING EARWIG FALLS OUT!!!!!!!!!!!!!!!!!! Then you attempt to contain your instinctive shrieks and curse words since you know the neighbors are out on their patio, and instead you do the most insanely uncontrollable flapping, hopping full-body shudder dance you have ever done in your life. The favorite gloves will now be consigned to occasional use, as they are now suspect and will always be The Earwig Gloves. No, I did not take a picture, but I did find another earwig while cleaning off the porch today so I can continue my long and tedious deck-painting project. I would much rather be gardening than painting or all of the other long put-off things on the house to-do list. But first, I will need new gloves. Ew, is there anything more skin-crawling than an earwig? Wait, maybe don’t answer that, I’m sure there is. At least it didn’t pinch me! I hope to be back to slightly more regular blogging now that summer is over and I’m no longer on all-day mom duty. We had a lot of fun and even saw a few nifty gardens during the school vacation, but the time for gardening, blogging and blog-reading (and commenting) was pretty much nil. I look forward to catching up on what you’all have been up to and seeing how your gardens grew during the season. 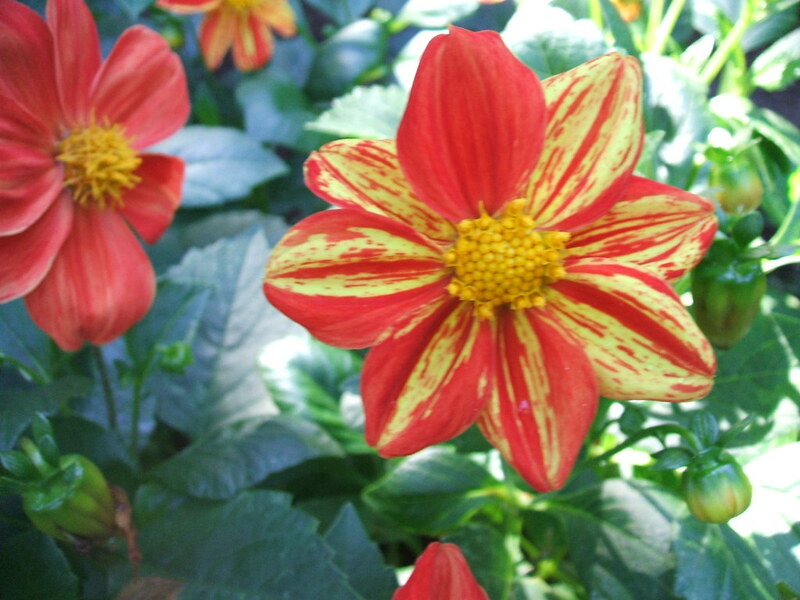 Much nicer than a bug photo, I hope – some cute stripy small Dahlias my mom grew this summer. It’s foggy here today, so I thought I’d put up some pics of a couple of really impressive dahlias I saw in a street garden near my house recently, to chase the blahs away. I will come straight out and say that I’m not much of a dahlia grower myself. I have a few dwarf annual ones that my mom gave me this year, but I think my garden lacks the proper combo of good soil, excellent drainage and regular watering to provide a good home for them. That’s just way too much cultivation for this lazy gardener! 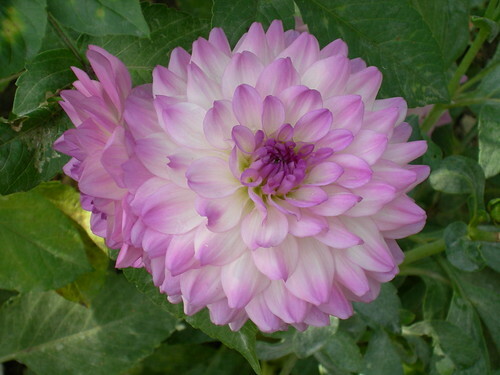 But for those interested in the basics of dahlia growing, one of the local dahlia groups near Seattle has this handy list of do’s and dont’s to get you on the right track. Part of my resistance to this plant is that it’s one of those that has a “society” devoted to it, or many societies as it happens. I’ve seen entire home gardens devoted to dahlias, and while I admire the dedication of folks who specialize in one flower or kind of plant, it seems a little sad to me to pick one that is only in bloom for a few months and goes completely below ground for much of the year, leaving a bare patch of nothingness in its wake. I’m pretty hopeless with dahlia types. I know there are many, but I’m not up on them so won’t even try to categorize the ones shown here. If you really want to get into the minutae, this site has photos of all the different dahlia classifications. I loved this one for its gentle lilac edging and lovely white and greenish-tinged underlayer. What about you? 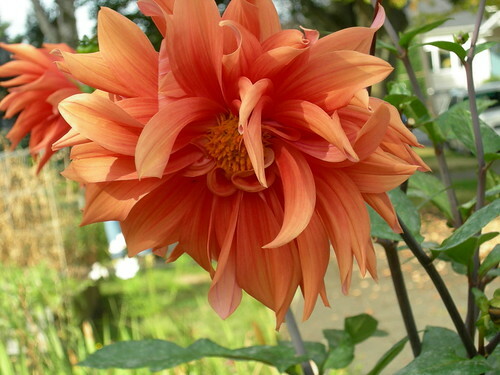 Love to grow dahlias or prefer to admire them in other people’s gardens? Or do they just leave you cold?